3.5 stars Even though I really enjoyed this one, I'm not going to give it 4 stars, because it was also slightly dissapointing. I can't really put my finger on it, but I guess my expectations were too high and/or I read too much (is there really such a thing?) brilliant fantasy in the past 10 years and am quite spoiled now in that regard. However, I'm glad I finally read it, since I bought it 10 years ago (hence the 10 year reference above) and have been longing to read it ever since, but just didn't for no good reason. 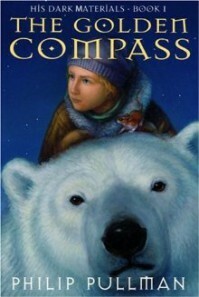 Instead of the protagonist of the book, Lyra, it is Iorek Byrnison I loved the most. The poster boy for grumpy cuddliness in a nutshell! Without revealing too much spoiler stuff, I thought the end conclusion (of this part that is) and reference to the bible was a bit odd. I read reviews here mentioning Philip Pullman is an atheist and the 'His Dark Materials'-series is an attack on Christianity and/or God himself. Even if that were true, I refuse to look for clues while reading the rest of the series. This is a story and should be read as a story. Period. Now on to the next one!